These top athletes rely on V800 to push them even futher. 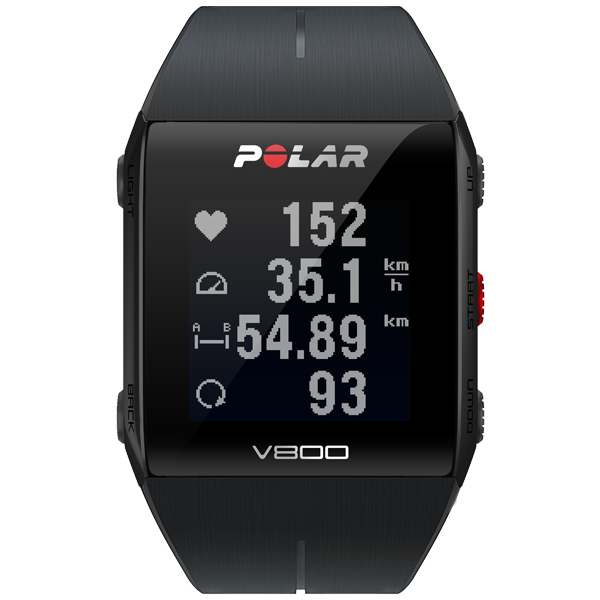 See how Frederik trains with Polar V800. Q: How old were you when you started doing sports? A: I started to swim competitively when I was nine, and got my first bike at the age of 17. My dad was a marathon runner so he got me interested in running from early on. Q: When you were young, did you have any idols in sports or otherwise? A: Luc van Lierde (who’s now my coach) was my idol when growing up. Q: What was your first contact to triathlon? A: I took part in a junior triathlon race in 1997 when I was 17, and that led to taking part in sprint triathlons. Q: How many hours do you usually train per week? 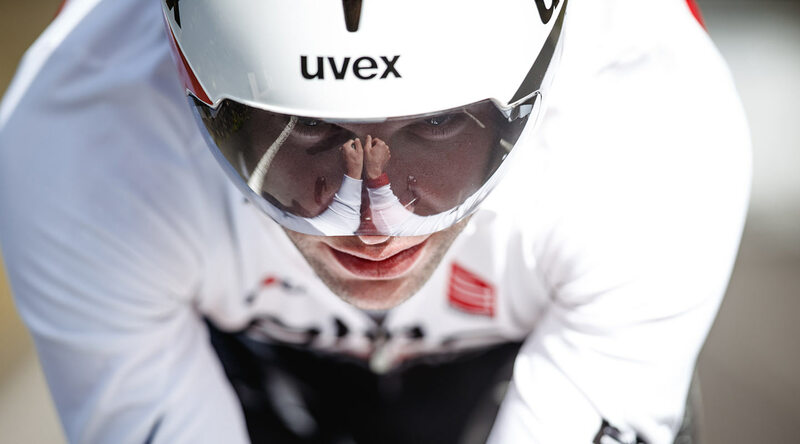 A: A hard week consists of 30-35 hours of training: 600-700 km on a bike, 30 km swimming and 100 km running. A: There’s no typical day for a triathlete – every day is different! Q: How do you know if your training is taking you in the right direction and you’re improving? A: If the numbers are good, if I’m feeling good and that I’m getting better and stronger, then I know. Q: What’s the most challenging aspect about your sport? A: It’s no longer the distance – that I can handle. Now the challenge is more about how to win and how to get faster and faster. Q: How do you handle a weak moment? A: I think about the support network I have and how lucky I am that I can fulfill my passion every day. A: By spending time with my family, playing with my sons and watching them play soccer. Q: Who is the hero in your life and why? A: My wife Sofia. She has supported me through financial problems and setbacks in training, and helped me become a champion. Q: Your greatest accomplishment as an athlete – so far? A: Winning the Ironman Hawaii World Championship in 2013. Q: What ‘s your next dream as an athlete? A: To win Ironman Hawaii for the 2nd time! And complete the race in under 8 hours (currently my personal best is 8:01). "I had a great day on my @cervelo #P5 in the Port Elizabeth area! 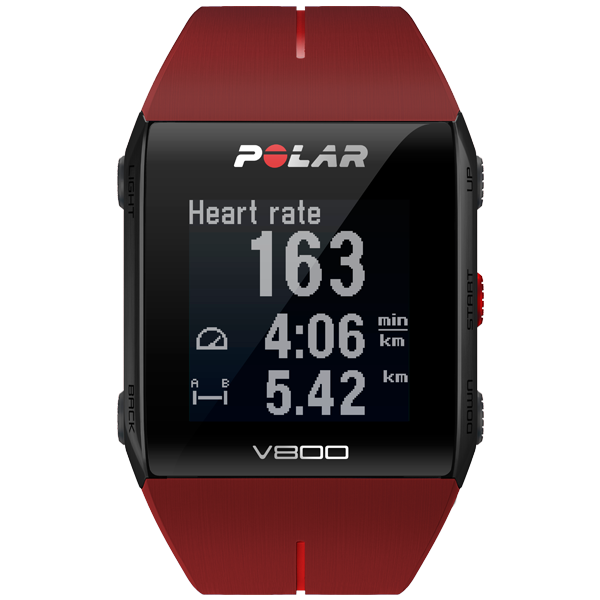 And my @PolarGlobal #V800 registered everything ;-)"
"My #WorldRun via @PolarGlobal @PolarBelgium"
See how Kaisa trains with Polar V800. Q: Could you tell us a bit about yourself and your training? A: I’m 31, which is pretty old already for an athlete. I’m conscientious about my training and even stress about it at times. I’m a perfectionist who ponders and analyzes things. I constantly aim to improve my performance – there’re always more ways to improve in biathlon. I’m very precise and don’t want to do anything in vain or half-heartedly. I don’t want to look back and think, say, that I didn’t train well enough last summer. It’s all the way or go home. Q: How much do you train on a yearly basis? A: I spend over a thousand hours a year practicing shooting. In mid-May, getting ready for a competition, I fired 15,000 shots. I practice 4-6 times a week and fire about 100 shots in each training session. I do physical training for 700 hours a year. 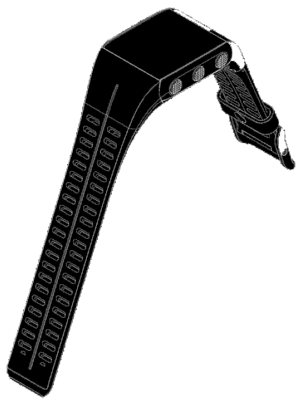 Q: What kind of a role do Polar heart rate monitors play in your training? A: My training’s evolved as we’ve started measuring it. During training I follow my heart rate so that I know how hard my body’s actually working. I train basic endurance, speed endurance as well as maximum endurance, and heart rate zones help me to stay on track. There are swings in heart rate every day, but by monitoring it I’ve learned to understand my body; know when I’m tired or coming down with something. I also measure speed and distance. Even a top athlete enjoys reliving the routes afterwards in Polar Flow. Polar products have fun features like the Training Benefit. I also follow my heart rate when racing, especially when I’m about to approach the shooting station. If my heart rate is too low when I start shooting, it can affect my performance. Q: How can you tell if you’re overtraining? A: Usually you don’t notice the signals of overtraining until afterwards, for instance if you get ill. In especially hard training I spot it. For instance last fall it wasn’t going so well. My coach said everything seemed great, but I myself felt it. When I’m overtraining, my heart rate just won’t get up. My aerobic threshold is 160 bpm, and if I have to ski at full stretch to reach it, then I’m overtraining. My body is so used to hard training that it’s not easy to spot overtraining. Getting back on track after overtraining can take just a couple of days for me. But the effects can be seen later, after some months, and analyzed even later than that. Q: What are your strengths as an athlete? A: Knowing my body and being responsible. Q: What’s the most challenging aspect about biathlon? A: The sport in itself is so challenging! You can always shoot faster, have better skiing technique and ski faster. I’m used to training a lot, and I know what it takes to reach the top. You have to find the kind of training that works for you. For me, long and calm jogs do the trick. Q: What keeps you going? Do you have days when you have to look for motivation? A: Yes I do have those days, especially if the weather’s bad. I might think of a way to replace the training with another activity, but I never skip it altogether. I always look at the bigger picture. Little things count, so I don’t like to make exceptions just because I don’t feel like it. A: By analyzing it. I seldom can just forget about it, but try to find out what’s causing it, and break it down. Q: Have you had bad injuries and how have you gotten past them? A: I had knee surgery in 2009 due to repetitive strain injury. I went through 5 weeks of rehabilitation, walking with crutches, and I couldn’t run or roller ski for 3 months. The decision to go through the surgery had to be made quickly: I only had 12 hours to decide. I took a chance and it paid off. Since then it’s been easier, and it was the only way for me to continue my professional career. Q: What does it take to reach the top of the world? A: You have to believe in what you do, be a realist and recognize what kind of an effect various things have on your training. Everything you do has an effect and your whole life is in the game, but there’s also a big crew that surrounds and supports the individual. A: I don’t have so-called normal days off – an athlete is always an athlete. I give my body time to recover and try to strain myself as little as possible. I sleep, read, knit and crochet, garden and spend time with my neighbors. Q: What would your perfect day off be like? A: My everyday life is so scheduled that in my spare time I don’t like to look at the clock. I’d want to stay out of the city and just do things around the summer cottage or in some other cozy environment. Measure your speed and distance while running or walking indoors – all from the movement of your wrist. Make your journey more exciting with Strava Live Segments. Get alerts about nearby segments, see real-time performance data during a segment and get your results right after you finish. Preparation is the key to success. Create detailed goals for different types of training and sync them to your V800 to get real-time guidance during workouts. Use the Orthostatic Test and Recovery Status to make sure that your body is ready for the next challenge. 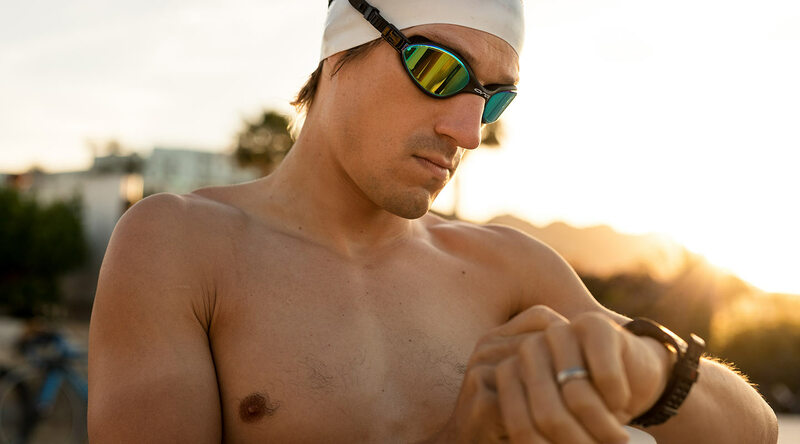 Create different sports profiles to see and record relevant data for each sport, from running to open water swimming. Get real-time guidance based on your goals. Track everything from altitude to heart rate. Create sport profiles and tailored views for each sport you do. Switch from one sport to another swiftly, without interrupting the training data recording. You can also check the transition times between sports. 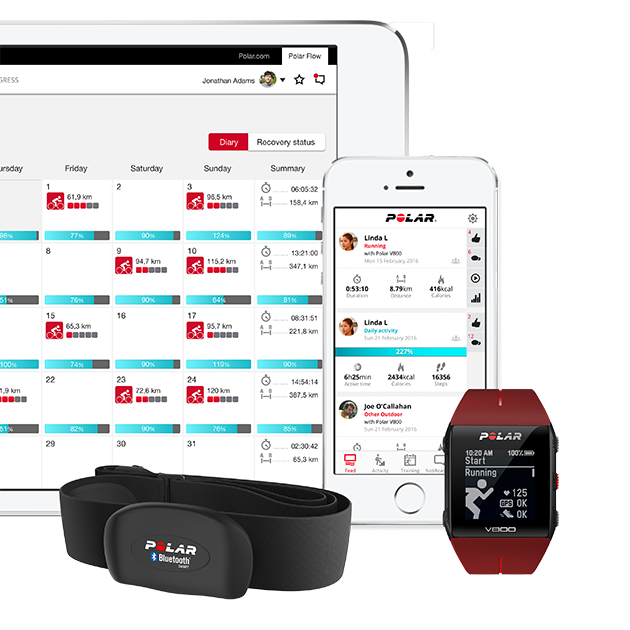 Polar Flow records each training session and lets you view the data quickly in the mobile app or in more detail online. The Training Load feature shows how hard you have worked and how long you need to recover. Get a quick overview of your training in the Polar Flow mobile app. Analyze every detail of your performance at the Polar Flow web service. Make sure that your training is taking you in the right direction. Go to Polar Flow to see your Running Index, Fitness Test results and a wealth of other detailed information. The most advanced training companion comes with smart notifications. 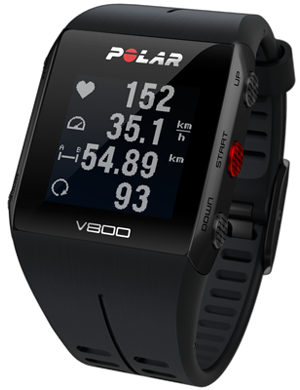 Designed for 24/7 use and demanding sports conditions, the V800 makes sure you stay in the know wherever you are. Check message notifications conveniently on the V800's display when your phone is not at hand. V800 will alert you about the appointments on your calendar and makes sure you're always on time. Get the latest social media updates on your wrist to make sure you're in the loop. Free online tool for your coach to easily create training programs and follow your progress. Sync with Strava via Polar Flow web service.